They say the moment you enter a college you change from boy to a man or from girl to a woman. Does this transition from high school to college excite you? Of course, it does! Every year thousands of school students take their first step into the college with new dreams and hopes, and a sense of independence and power. They say in Hollywood, with great power comes greater responsibility. While experience teaches us a lot, it is always wise to prepare in advance. Your high school might have taught you about Algebra, Science, and History. Yet there are certain practical aspects of life that you might find challenging to deal with in your college. Hence, you must know how to face them and make your life easy and fun. 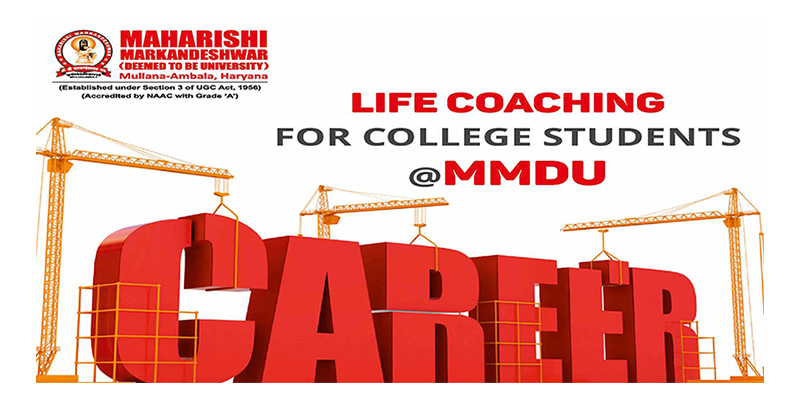 We at MMDU are aware of this big transition by our students, so every freshman year student of our university is going through life coaching program. So, if you want to avoid the terrifying task of entering the real world that might act as barriers to your success, here are a few important lessons for you to learn now. When you are in school, you are given a very structured schedule in school as well as a home by your parents. Here we teach you how to manage your time effectively. Keep account of your time like you manage your bank account. Set priorities and do tasks that re important for your growth first. Mentors at MMDU will help you with this important productivity tool. When you step out of your home, the foremost important skill to master is managing the finances. Students should understand the value of money and learn the basics of money management before they head to college. This comprises of maintaining a monthly or weekly budget, and paying bills. In addition, they should also understand how handling daily expenses can help them set a household budget and work within it. Emergencies can occur anywhere, anytime. Many teenagers have never dealt with any emergency without their parents’ or mentors’ help. Hence, they need to know what to do if some critical situations like car accident arise where they have to make a visit to an emergency room. Say, for example, if you fell ill, you should know how to deal with the medical department, billing procedures, etc. Also, learn to keep an emergency pocket diary with you that contains all the necessary information about you, your family and a few important contact numbers like police, ambulance, guardian’s address and number, license number, etc. As a grown-up, it’s time for you to take charge of your own life. You might need to live away from your home to pursue your career. As such, you should know some basic home skills like taking care of your laundry, cooking food, buying stuffs from the market, etc. Hence, you should learn such household chores from your parents during your high school days. Gone are the days when parents and teachers will be available for you 24*7. As a grown up, you should learn to stand up for yourself as it is vital to earning respect in your class and college and wherever you go. However, it’s difficult to be your own advocate when you lack self-belief. Also, if you are unable to express yourself clearly, you might struggle in life. Hence, build your own belief and boost your confidence and talents in order to stand up for yourself. Life is unpredictable and offers you mixed situations. At times, you might feel lost, stressed and anxious. As a teenager, this is quite common. Hence, you must learn to deal with stressful periods during your high school life. Stress management is a very sensitive topic for teenagers. Seek help from various sources like health and meditation apps, follow some spiritual gurus, and practice good reads. All these things will help you deal with major stressful life events you might encounter. You can also follow some yoga classes on YouTube that will make you feel serene in no time.